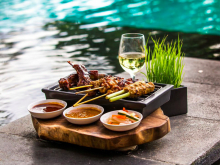 My Bali Food Safari adventure began when I was on holiday in Bali looking for a way to try a variety of restaurants on my few precious nights away from the kids. My background in management, hospitality, customer service (and eating!) has helped sew together the foundations of this tour, where my goal is to present you with a fabulous dining experience while you are in Bali. As we also believe in giving back, we also donate a part of our proceeds to local orphanage, Bali Kids. Come on one of our food safaris soon and let my team and I help you discover the most exceptional and unique food in Bali! Bali Food Safari is simply amazing. From the pickup, through all the restaurants we visited, to being dropped back at our villa - we enjoyed every single minute. The restaurants were all places we had not visited before and the dishes we had not tried before either - so it was a real gastronomic experience for both my husband and I. My husband is a foodie and enjoyed all the tastes and environments of the restaurants we went to. An experience we will definitely remember for a long time to come. Kudos! As a big foodie, I was eagerly looking forward to this dining adventure. Choosing to visit 4 venues instead of of 3 ,we were never told which stop was next so there was always a sense of surprise but also uncertainty if the next place is going to be up to the mark but every single time our expectations were not only matched but exceeded. In one night I had tasted flavours and dishes never before experienced. For instance - Rabbit Satay ! Although I am not going to ruin the mystery aspect I can truly say that this is value for money as the venues chosen were some of the best places in Bali. The team really know which dish to order from which kitchen, so even if you have been to a restaurant before - chances are that what you are trying will be something completely new or customized. The company on the night was great and even if you are not a 'foodie' per say, this is a super-fun night out! What I think I appreciated the most is that I pretty much didn't have to do any work to enjoy all this good food!! No need to trawl through Tripadvisor to figure out where to eat and what to order (my usual habit while on the road). All I had to do was get in their car and follow the host! Based on the 4 places we went to, I could tell that the staff had put in a lot of effort to mix up the types of dishes we would try and select restaurants that had their own unique atmosphere and aesthetic. That kept things fun and interesting for all of us. Because we were on a special trip, some chefs even served up special off-the-menu items that made us feel like VIPs. The luxury van they used to take us around was also extremely spacious, so my dining party was always comfortable mixing with other guests while we were on the way to the next place. All in all, I had a really enjoyable evening of delicious food and would recommend this food safari to anyone looking to try new things and get a taste of the best food in your area! 5 STARS! !